Shahbag, Dhaka: The Beginning of Another Tahrir Square? Shabag, Dhaka on Tuesday night. Hundreds of people with candle lights are in protest. Remember Tahrir Square? 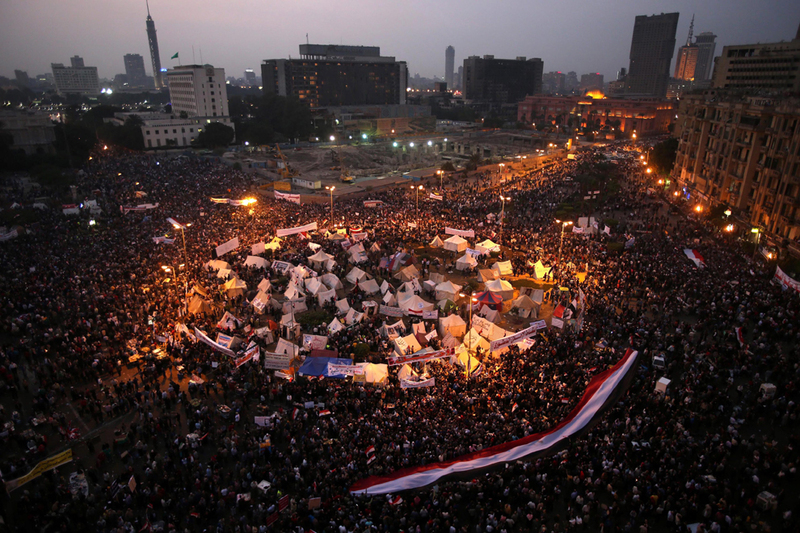 The legendary Egyptian Revolution in 2011 against the then president Hosni Mubarak? Sitting in the middle of Dhaka, Bangladesh, I am sensing another Tahrir Square in Bangladesh, right in Shabag, Dhaka. Several hundred people staged a sit-in at Shahbagh on Tuesday demanding capital punishment to Jamaat leader Abdul Quader Mollah for war crimes. The tribunal has sentenced Abdul Auader Mollah for lifetime imprisonment, which a huge portion of people has rejected. Well I hope it won’t turn out to be another Tahrir. Because what’s happening in Egypt now, can’t be called something good. its not against the govt., its against d war criminals of 1971.
i want it. really i want another tahrir squre. that should be against the top two party, AL & BNP. i talked a lot of people, all of them want a 3rd/4th party to select as govt. Punishment of war criminals is must. I support the role of youth in this respect and I hope they will also think to find a way out of the present corrupt politics of the political parties. Razakars didn’t only try to obstruct the birth of a nation, They didn’t only betrayed their nation, they committed the all sorts of crimes to the highest degree in 1971. They have no right to live freely in this free country. Politicians are responsible for this stigma of our nation. We should make sure that politicians don’t play game again and let these criminals go free again. We should make sure that Justice is served. Welcome our new generations. Hope it will continue generation after generations…good luck. Go ahead brothers and sisters. Want to see war criminals free Bangladesh. Hang all war criminals & their associates. They ruined are social life. Shame! war criminals are our political leader. shame! young generation whose are their follower. i have never seen this face of my country before this.. if this continues after my ssc exam, i wish i would join them too..
Shahbag squires young people . how do you get this inspiration . This is highly appreciable the youth of the nation devoted their true love for their mother land…….to free from heinous war crime in the name of Islam. With my little knowledge, I never found such war crime against humanitarian in history of Islam. In my mother land they did-excused-become politician under the Islamic flag. The youth should take the lead to ensure establishment of the justice against war crime. We the youth should not forget heinous crime– the murder of Shagor-Runi; National Corruption; Bankruptcy; sabotaging in RMG industry; the BDR mutiny……..so on ……. We need not to be mare politician but we need to be conscious Bangladeshi…….to have the clear understanding of the practices of our filthy politicians and stop them. It is our duty uphold the name of our motherland in the universe with honor & pride ……Build a nation free from corruption-injustice-sabotaging of industrial growth……..
You are Rajakar? Try to be true Bangladeshi.